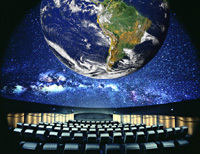 Our Club will tour a small, privately held company located in Chadds Ford, PA that has become the world’s largest supplier of planetariums and domes, with over 1,200 installations worldwide. Bring your children aged 5 to 15 along for a family-focused presentation at 10 AM. Following this young people's presentation, the young people will have a chance to sample water ice while the adults continue in the planetarium with a presentation of technology and market innovation that allows Spitz to compete in a worldwide market. "As a complete integrator of planetarium and spherical projection theaters, Spitz provides display systems, automation, lighting, audio and design/engineering services... of some of the most innovative structures in the world. Founded in 1946, Spitz began as a provider of affordable optical planetarium projectors for schools and small educational institutions. Since then, Spitz has grown to become the largest supplier of planetariums and domes. Spitz projection domes are chosen by the most discriminating customers including Disney, Universal Studios, Volkswagen, Griffith Observatory and Zeiss… Despite enormous growth throughout our 50+ year history, Spitz has continued to maintain its focus on educational products and services." Photos courtesy of Spitz, Inc.
Spitz is located just off Rt. 1, south of the intersection of U.S. Rt. 1 and U.S. Rt. 202, in Painters’ Crossing, Delaware County, PA.
From Rt. 1 southbound take a right turn onto Brandywine Drive at the traffic light where you see Hannum's Harley-Davidson. Turn left into the parking lot behind Hannum's. Spitz Inc. is the large building beyond the parking lots. Enter at the office door at the left side. Using the address given above, Google Maps gives the correct location of Spitz. Using MapQuest, go farther up Brandywine Drive than indicated, into the parking lot beyond Hannum's.